It could have been written especially for them. Grandiose sloganeering at its best, 'Suicide Is Painless' was an epic just waiting for the MANIC STREET PREACHERS to cover it. James, Richey, Nicky, and Sean have taken the theme from M*A *S*H and turned it into the least embarrassing rock anthem of all time. It should be subtitled 'Helicopter Emptiness'. The song has given the Manics their first ever Top Ten hit, its chart success providing the perfect curtain raiser for 'Ruby Trax'. 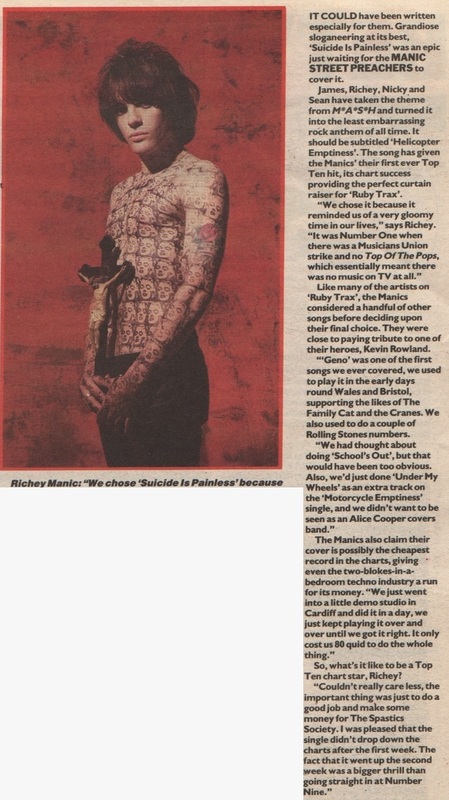 "We chose it because it reminded us of a very gloomy time in our lives," says Richey. "It was Number One when there was a Musicians Union strike and no Top Of The Pops, which essentially meant there was no music on TV at all." Like many of the artists on 'Ruby Trax', the Man ics considered a handful of other songs before deciding upon their final choice. They were close to paying tribute to one of their heroes, Kevin Rowland. "'Geno' was one of the first songs we ever covered, we used to play it in the early days round Wales and Bristol, supporting the likes of The Family Cat and the Cranes. We also used to do a couple of Rolling Stones numbers. "We had thought about doing 'School's Out', but that would have been too obvious. Also, we'd just done 'Under My Wheels' as an extra track on the 'Motorcycle Emptiness' single, and we didn't want to be seen as an Alice Cooper covers band." The Manics also claim their cover is possibly the cheapest record in the charts, giving -even the two-blokes-in-a-bedroom techno industry a run for its money. "We just went into a little demo studio in Cardiff and did it in a day, we just kept playing it over and over until we got it right. It only cost us 80 quid to do the whole thing." So, what's it like to be a Top Ten chart star, Richey? "Couldn't really care less, the important thing was just to do a good job and make some money for The Spastics Society. I was pleased that the single didn't drop down the charts after the first week. The fact that it went up the second week was a bigger thrill than going straight in at Number Nine." This page was last modified on 26 March 2018, at 08:58.